Having mixes in the pantry are great if I remember to use them. 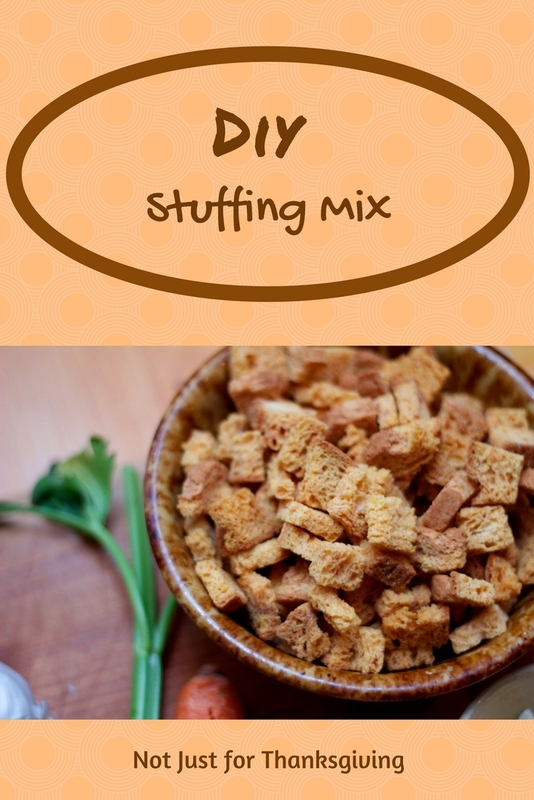 The Stuffing Mix seemed the perfect choice for binding meatballs and it’s already seasoned, so it’s quick and easy to use. In a medium bowl, beat together milk and egg. Add stuffing mix and set aside until bread cubes have softened. Shape mixture into 1 inch balls and place into a baking dish. Bake until browned and no longer pink. In a medium sauce pan, melt butter. Add mustard to melted butter and whisk together. Whisk in flour until smooth. Pour in broth and whisk until blended. Cook over medium-high heat, stirring continually, until the mixture boils. Reduce heat and continue to cook for 1 minute. Stir in Worcestershire sauce and season with salt and pepper to taste. Remove from heat and add cream. Stir thoroughly. 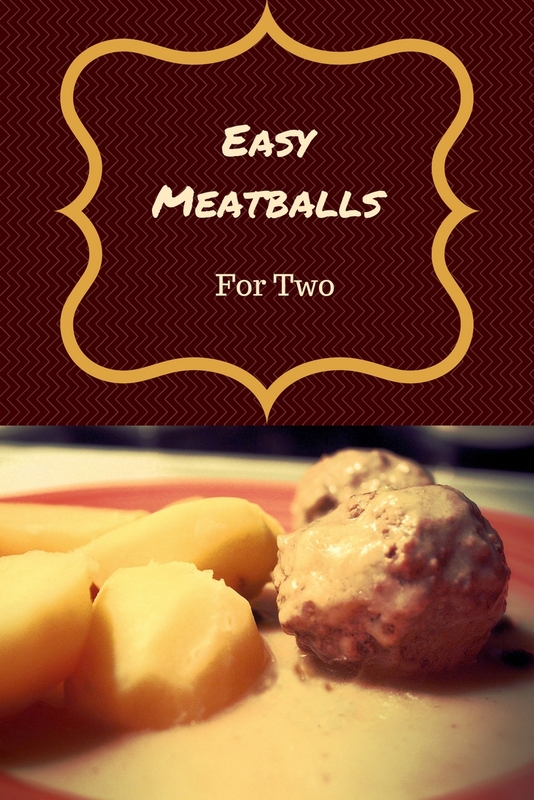 Serve meatballs over mashed potatoes, pasta or rice. Top with gravy. My favorite part of Thanksgiving dinner is the stuffing. Maybe the pumpkin pie, too but mostly the stuffing. The meal is simply incomplete without it. I make a big batch every year and there’s always plenty of leftovers. This is one time I don’t worry about it because not a crumb will go to waste. Bread stuffing is just too good to only have once a year. There are alternatives to homemade but packaged stuffing mixes are just short of awful, in my never humble opinion. They are loaded with salt and little else. In their defense, they are convenient. A weeknight dinner doesn’t lend itself to lots of time-consuming cooking in most households. Even in my retirement, when time is not at such a premium, I don’t want to spend a lot of time on dinner. There are simply too many other things to do. That doesn’t mean I don’t want good food. It’s why I love this mix. It takes a couple hours to make but most of that time is waiting for the bread to dry in the oven. I use the French or Italian bread I find on the clearance racks at the store. It’s usually half the price of a fresh loaf and perfectly good for this mix. Cubing the bread is a little tedious, but worth the effort. The original recipe calls for adding dried onions to the mix. I made them optional in my version because, if I make it for stuffing a chicken or a side dish, I want to add fresh onions to it. If I use it as part of a recipe, then it’s easy to add a bit of dry onion. Preheat oven to 300 degrees. Put bread cubes in two 13×9 baking dishes. Toast the bread in the oven, stirring occasionally. Remove from oven and cool slightly. Drizzle oil over bread cubes. Add onion (if using), parsley, garlic salt, sage, and pepper. Toss to combine. Store in an airtight container. Use within 3-4 months. The following is straight from the Make-A-Mix book. I’m sure you would only need half of this recipe to stuff a chicken. In a large bowl, moisten stuffing mix with liquid. Melt butter in a medium skillet. Saute onion and celery until tender. Combine with stuffing mix and toss lightly. Mixture can be baked in a lightly buttered casserole for 30 minutes at 350 degrees. What mixes do you like to have in the pantry? Please leave a comment. 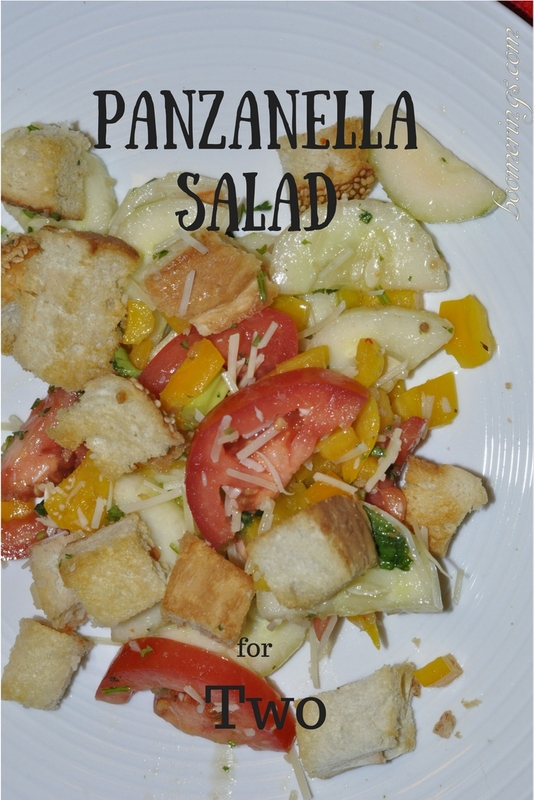 Panzanella Salad is a delicious mix of tomatoes, cubes of crusty bread, and a rich dressing. Does it surprise us that this salad, that has been around since the 14th century, didn’t originally include tomatoes. A previous post about a bit of tomato history is here. It just wasn’t that tomatoes weren’t available in Europe until the 16th century, they were suspect as a food source long after. The first references to this salad described it as a mix of onions and stale bread. The recipe of that time consisted of pieces of bread soaked in water and vinegar and then tossed with any fresh vegetables that were available. Onions have long storage time and were often the freshest produce around. That doesn’t really sound that appetizing but with the reputation of the tomato, who am I to judge? In the middle ages, bread was a staple of life and a precious resource for families. Most households did not have an oven inside their residence. People had to use the communal ovens in their village to bake bread for their tables. Oven space was finite, so bread was baked only when ovens were available. Couple this with the inability to store the bread well and the loaves often became stale before the next baking day. Panzanella salad is thought to be a way that people of that time used their stale bread so that it wasn’t wasted. The tomato remained absent from this salad until the twentieth century when availability was increased and superstition was decreased. Not only is this salad a good repository for leftover bread but any fresh vegetables in the refrigerator can be added. So in keeping with the concept of Don’t Toss It-Eat It, use any leftover bread you have on hand, such as, the last of the dinner rolls, the remainder of a loaf of bread too large for your family, or the heels that no one wants. Toast them for Panzanella instead of tossing them. Heat oven to 350 degrees. Place bread on a baking sheet and bake until crisp. Combine vegetables in a large bowl. Mix lemon juice and dressing. Pour over vegetables and toss until coated. Add bread cubes and toss to combine. Serve immediately. Note: For an extra punch of lemon, add the zest from one lemon to the salad. You are standing in front of the open door of your refrigerator when you spy a container near the back and you pull it out. Inside is a hairy, foul-smelling mess that was once food but now doesn’t resemble anything edible. We’ve all been there. According to the Department of Agriculture (USDA), 30-40 percent of food in the United States is wasted. Astounding! 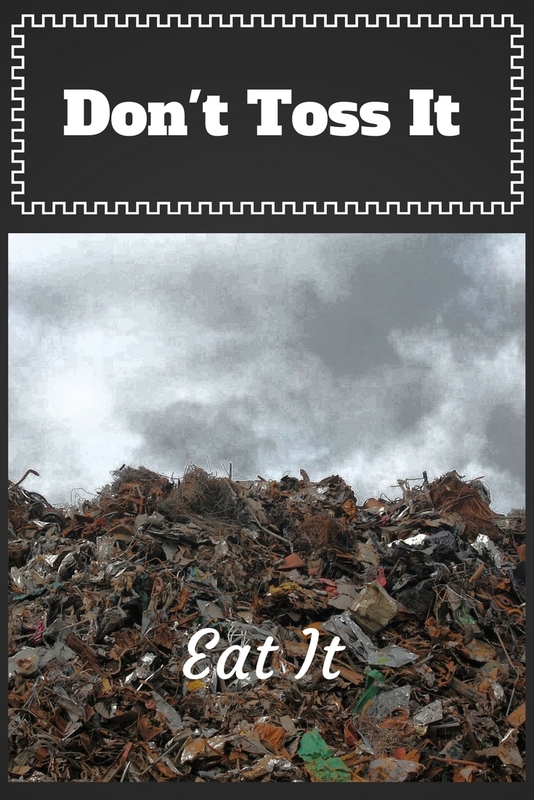 Wasted food is also the single, largest component of our landfills. All of this waste costs approximately $165 billion each year. Imagine what we could do with that money. According to the National Resources Defense Council (NRDC), a non-profit organization, the average American throws away 300 pounds of food each year which costs us about $2200. That is almost $200 per month of loss. Imagine what we could do with that money. If food takes up 10-15 percent of our household budgets, it just doesn’t make sense to throw so much away. In the coming weeks, I’m going to offer some solutions I have used for taming the leftover monsters. One of the ways to get started using leftovers is to notice what you always have left over. I know, obvious. In my effort to cook for two, I sometimes end up with a third serving. This usually is the result of using a whole can of something instead of a partial, which would just spoil in the refrigerator, I’m sure. One of the things I have done is to take that leftover serving to work as my lunch. Since I am now retired and I’m watching my calories, I don’t eat much for lunch anymore. So there the container sits. To get started, here’s my recipe for Stuffed Pepper Soup. It seems I always have a little bit of rice leftover and it’s not very good reheated. It does work very well in soup. 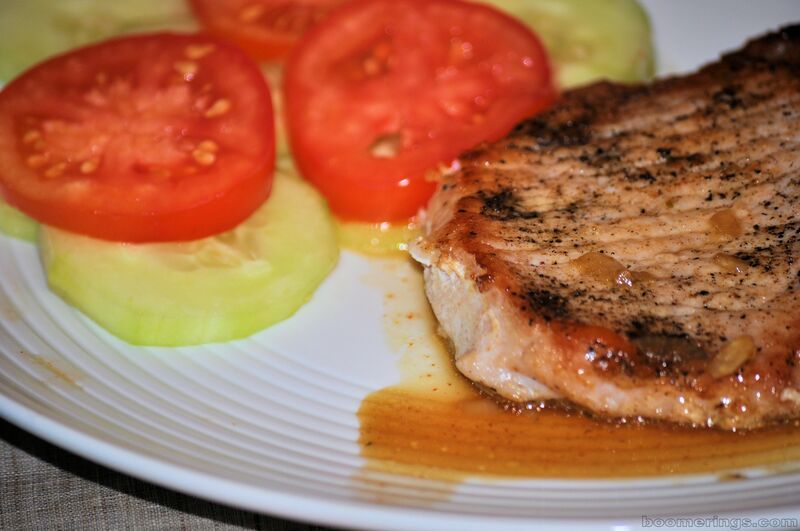 This recipe is also a good use of a green pepper that is a little wrinkled and, instead of canned tomatoes, over ripe tomatoes peeled and diced would work very well. Brown ground beef. Add onion, green pepper, and garlic. Sauté until tender. Stir in tomatoes and beef broth. Add seasonings. Simmer for 15-20 minutes until flavors have blended. If you have an Instant Pot, 5 minutes on high pressure is all you need for this soup. Add in rice. Cook another 1-2 minutes to heat and soften rice. What’s your favorite way to use leftovers? Be sure to leave a comment. There is something to say for having a few meals in the pantry for those times when you can’t think of what to fix or when your time is short. 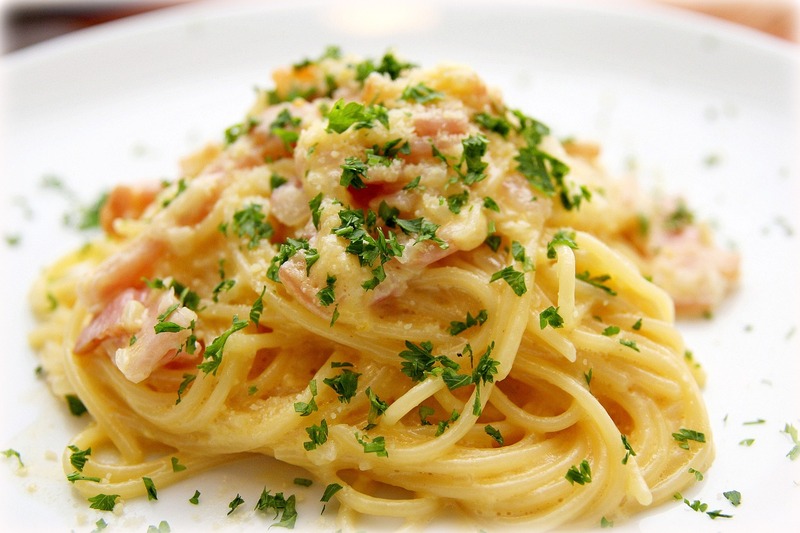 This easy carbonara for two requires only 6 basic ingredients. (Seven if you want to add a handful of peas) It might be argued that this really requires 8 ingredients if you count the salt a pepper. OK. So maybe it’s 8 instead of 6. Still, not many ingredients and they are all things I keep on hand. Bring salted water to a boil in a large sauce pan. Cook spaghetti according to package directions. Reserve 1/2 cup cooking water; drain well. In a small bowl, whisk together egg and 1/4 cup Parmesan. Set aside. Meanwhile, cook bacon in a skillet, over medium heat, until crisp. Remove and drain on a paper towel. Reserve drippings. Saute garlic in drippings until fragrant. About 1 minute. Add pasta to skillet. Working quickly, stir in egg mixture. Add reserved pasta water a small amount at a time until it is smooth and creamy. Fold in bacon, parsley and peas, if using, and top with additional Parmesan. Serve immediately. A simple sauce is all you need to dress up a chop. Season both sides of chops with salt and pepper. Brown chops in the oil over medium heat until cooked through. Remove from pan and keep warm. Saute shallot and garlic in the pan drippings. De-glaze with vinegar and cook until liquid is almost completely reduced. Add broth, sugar and chipotle to pan. Simmer until liquid is reduced by half. Remove from heat and stir in the butter. I’m OK with just a hamburger patty as an entree but, if you want to elevate the simple patty, you can call it Salisbury Steak. Beat egg lightly in a mixing bowl. Add next five ingredients and stir to moisten. Crumble beef over mixture and mix well. In a small skillet, fry bacon until crisp. Remove and drain on paper towels. Reserve drippings. Mix parsley into beef and shape into two oblong patties. Spread 1/4 cup flour on a plate. Dredge patties in the flour and brown in bacon drippings. Meanwhile, melt butter in small sauce pan. Add mushrooms and saute until tender. Sprinkle 2 tablespoons flour over mushrooms. Add beef broth, whisking continually until thickened. Continue to simmer for 2 minutes. Remove from heat and add the cream. Season with salt and pepper to taste. 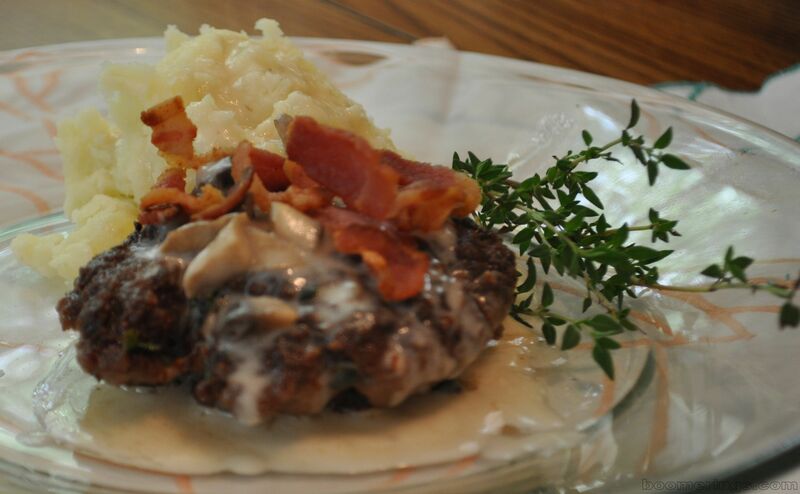 Top patties with mushroom sauce and bacon.